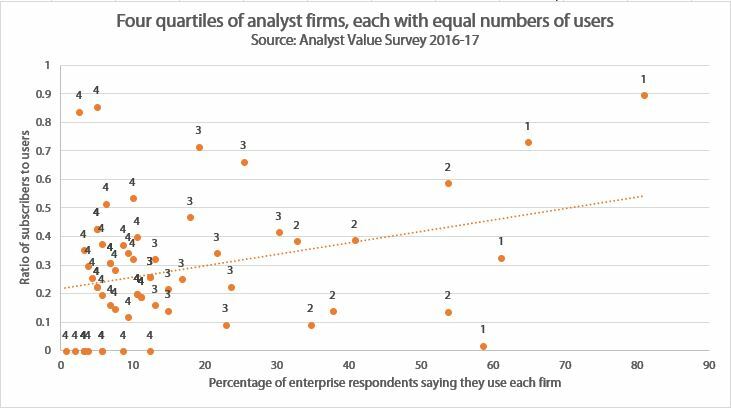 Managers in large enterprises, and especially those involved in evaluating and deciding about technology choices, use more analyst firms with each year. Our AVS has shown that the different layers of the analyst community, what we call the four quartiles, are used with different frequency by different users. The Analyst Value Survey asks them which firms they use, and whether their organisation subscribes. In the 2016-17 survey, enterprise respondents typically used ten firms. On average, 3.6 of those ten “use channels” (as we call them) were subscribed to by their organisation. Interestingly, there’s a lot of difference between analyst firms when we look at each company’s ratio between users who are, or not, in a subscribing organisation. In our research, we talk about analysts’ business models falling between two poles: premium and freemium. The analyst firms who keep most of their reports to paying subscribers are the premium ones. That includes many of those whose research is used the most, such as Gartner, IDC and Forrester, as well as mid-sized firms like 451 Research and firms in the CXP Group. On the other hand, the firms whose research is consumed overwhelmingly by people in organisations that don’t have a subscription are freemium: most of their research is consumed for free, and those firms sell premium services to a minority, often firms on the supply-side of the market. Most firms have largely freemium models. The chart above organises the most-used analyst firms into quartiles. Taken together, the firms marked with a 1 have around one-quarter of all the use channels, and so do the firms marked 2, 3 and 4. There are smaller firms, not shown on this chart, but their impact is too small for us to show on this chart. The trend line slopes up to the right, meaning that larger firms have more of their users in subscribing organisations. It suggests that small analyst firms generally have freemium business models, and large firms tend to have premium business models. Of course, people pay more attention to the firms they pay money to, and they generally don’t trust free research as much. Even so, it’s clear that decision-makers are getting second, third and fourth opinions. Which influence matters to you? All of this use translates into influence. However, different analyst relations teams focus on different influencers. Purchasing is very diverse: for example, some firms focus on the analysts who are used the most by those involved in decision and evaluation, but others have more strategic targets among the line of business managers who rely on fewer analysts: often line of business managers only have easy access to free reports, generally produced by firms with freemium models. As a mature player in a highly-structured market with centralised and stable buying patterns, your firm might want to focus on the evaluation and decision stage. On the other hand, in a growing market with more decentralised purchasing, you need to take account of the research consumed by the clients’ whole buying centre, including those involved in strategy and requirements development. Indeed, in our B2Buyology study, we found that a large minority of IT spending is made by these line of business managers without reference to corporate experts in IT evaluation. To find out more, read about the Analyst Value Survey. This entry was posted in 2. Drive and Determine Goals, Analyst Value Survey, On Research Firms. Bookmark the permalink.